Caesars Atlantic City opened in 1979 and has expanded to become one the most prestigious and exciting gambling spots on the East coast. This magnificent complex is bigger and better than many other casinos; it boasts 3,400 slot machines alone. The casino and gaming area as Caesars Atlantic City covers over 145,000 square feet and everyone from poker players to slots enthusiasts will be able to find their favorite game here. Poker beginners might like to hone their skills at playpokerfree before visiting Caesars Atlantic City and entering into one of the many tournaments on offer. Poker buffs will find a warm welcome at Caesars Atlantic City. There are 20 poker tables and all are smoke-free and serviced by waiting personnel. Those players who want to limit their spending in order to assess their skills will be able to take part in Texas hold’em no limit from $1-$2. There are plenty of high stakes games for the more adventurous players. The casino also hosts two daily Deepstack tournaments with an entrance fee of $100; the successful winners will then be invited to participate in the monthly $10,000 Freeroll championship. After a short time playing poker online, any player should feel confident enough to play live at Caesars Atlantic City. For a $5 entrance fee, some players might like to try their hand at the three card poker $1 million jackpot game. Slot machine enthusiasts will discover that Caesars Atlantic City not only has a huge array of machines but also caters for video poker fans too. Stakes can start from as little as $0.01, right up to the $1,000 machines. The slot machine areas houses 130 machines, with $1 to $500 games. There is also a slots section devoted to Hangover Slot Machines, where a ‘wild time’ is promised. Caesars Atlantic City is proud of the selection of table games that it can offer its clients. The 135 tables have games including baccarat, roulette, craps and Texas hold‘em poker. Caesar’s has also introduced a Palace East section where the oriental games of pai gow poker and pai gow tiles are on offer. A stay or visit to Caesars Atlantic City is a truly stunning experience. Whether someone is just popping into the casino for a day, or taking advantage of the luxurious hotel, or perhaps one of the hotel’s Stay and Play packages, there is always something to do. From first class dinning areas to sumptuous buffets, those who enjoy their food will find that all tastes and appetites are catered for. Caesars Atlantic City is famous for its shows and has opened its Circus Maximus Theater to cater for 1,500 spectators. Tony Bennett, Van Morrison and Smokey Robinson have all performed at Caesars Atlantic City in the past, and the venue still continues to attract big international stars. A stay at Caesars Atlantic City should prove to be a fun and entertaining time for all. 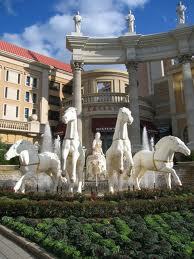 Have to say, I love Ceasars, it is always nice going to Vegas compared to Atlantic City. Vegas is Vegas, can’t beat it! Ben you are absolutely right no one place like vegas for poker or Ceasars, its great fun.